Mike Padua at ShootFilmCo.com has spent the last year creating unique vinyl stickers, patches, and lapel pins that honor traditional film photography. 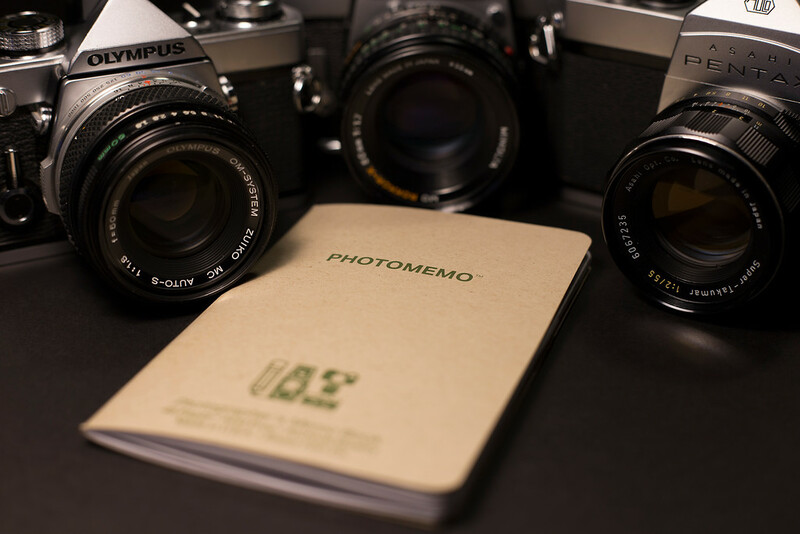 The latest release is the PhotoMemo Photographer’s Memo Book. 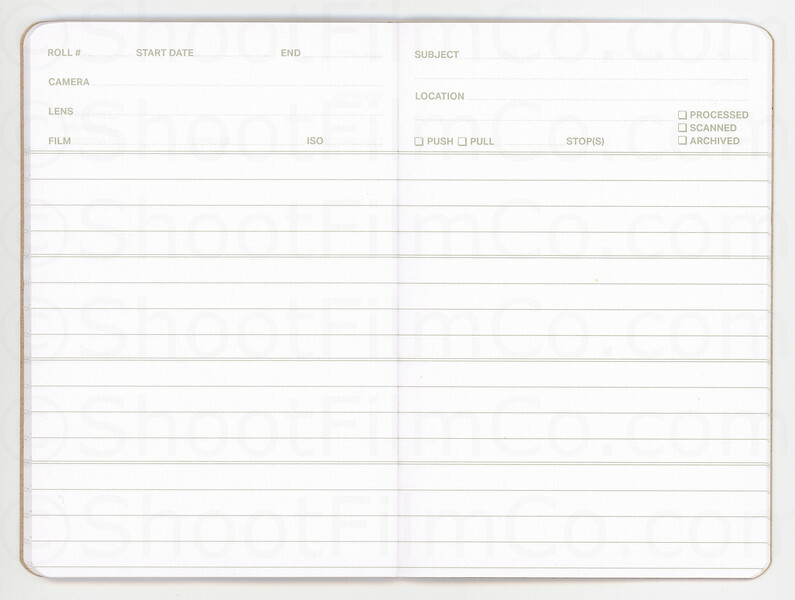 The book is intended to give film photographers an easy-to-use and inexpensive way to record data. The internal pages of the PhotoMemo is a two-page spread designed as a “roll journal,” with space for photographers to note: roll number, start & end dates, camera & lens used, film type, ISO, subject & location, push or pull x-number of stops, and where the photographer is at with the processing, scanning and archival process of the negatives. Each book is 48 pages with 22 two-page spreads, and measures 5.5” x 3.75” (13.9cm x 9.5cm). The cover is 100 lb Neenah Environment Desert Storm (30% post-consumer fiber). The book pages are 60 lb Finch Opaque Smooth Text that are acid-free and archival quality. 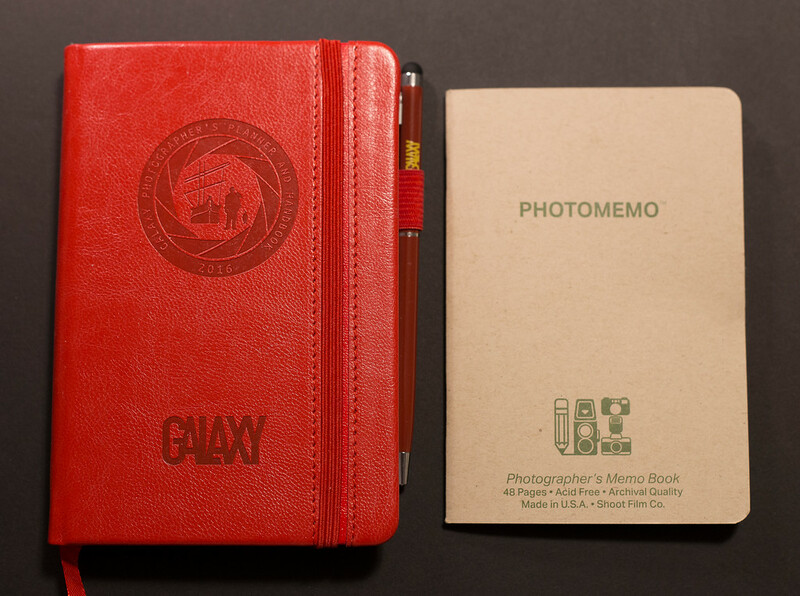 To give you an idea of the size, and usefulness of the PhotoMemo, let’s compare it to the high-end Galaxy Photo Planner & Handbook. I was an early backer of the Galaxy book on Kickstarter. I was also one of the majority that are somewhat disappointed. The PhotoMemo book costs $9.99 for two, the Galaxy was $37, now $35. The Galaxy is larger, and thicker than the PhotoMemo. The outer design of the Galaxy is a reproduction of a Moleskin notebook, very attractive. 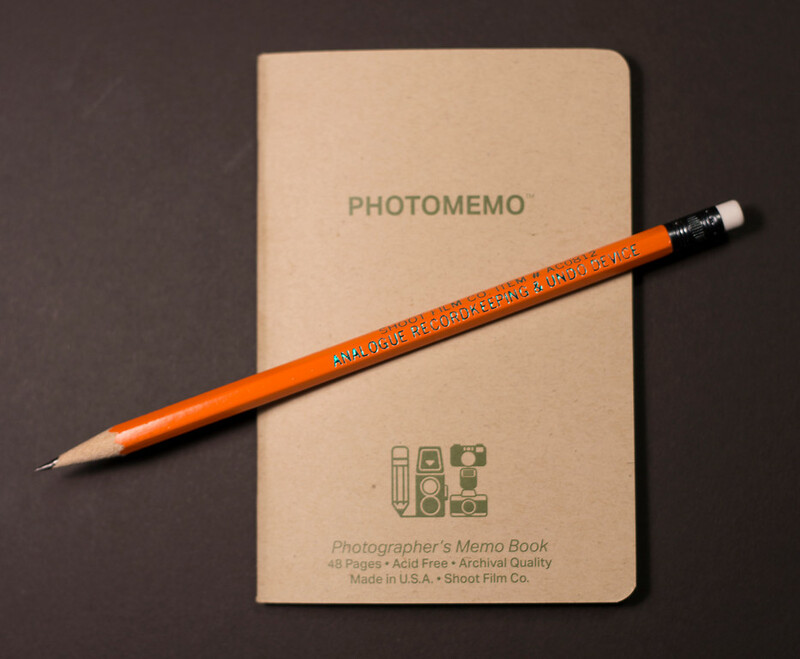 The outside design of the PhotoMemo is simple, like any notebook you might find at an office supply store. But really, it’s the inside that counts, right? Unfortunately, the creators of the Galaxy wasted several pages that could have been useful for noting photo data. Instead, they included names and website info for various online camera stores, photo galleries, agents, major photo suppliers, photography media – magazines and publishers. For me, the one main advantage of the PhotoMemo book is the two-page spread that allows you to write the width of the book. 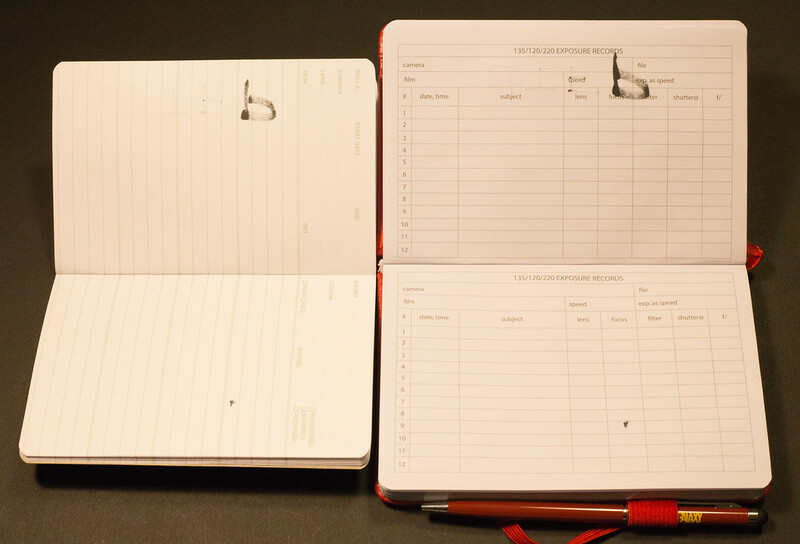 The Galaxy book requires you to turn the book ninety degrees to write the same type of data. Why did they do this? 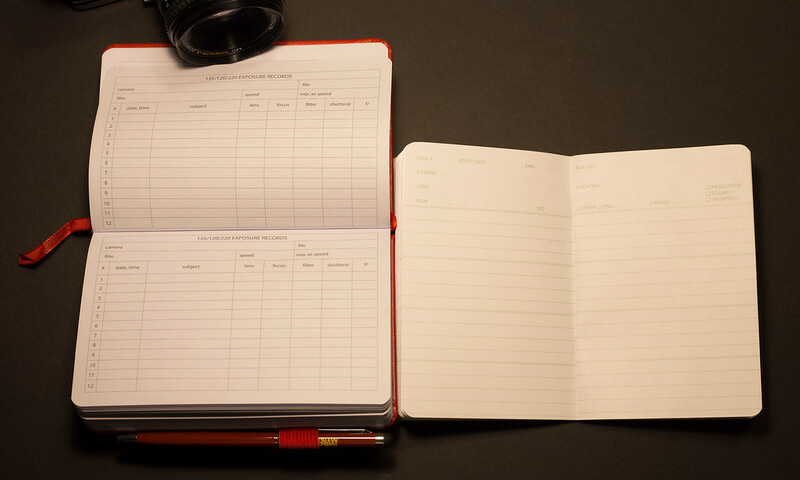 The PhotoMemo pages allow enough space for a photographer to record not only the details of the shots, but make additional notes for developing chemistry and darkroom data. The Galaxy book has grouped these pages together, i.e. x-number of pages for recording shot information, x-number of pages for recording darkroom and chemistry details, and even different pages for photographers recording data for large format photos. It makes no sense to me why the Galaxy book was formatted this way. Fellow film photographer and host of the Classic Camera Revival Podcast, Alex Luijckx, asked me if the paper thickness would allow him to write with a fountain pen. Not having one of Alex’s fancy fountain pens, I decided to use different types of ink on the paper: a standard Bic pen, Write Dudes 0.7mm pen, Pioneer Albums CD pen with permanent ink, and a classic Sharpie. With the two permanent markers, there was some bleeding through and onto the next page. What you would expect. The 60 lb paper in the PhotoMemo held up better to my two standard pens than they did on the paper in the Galaxy book. 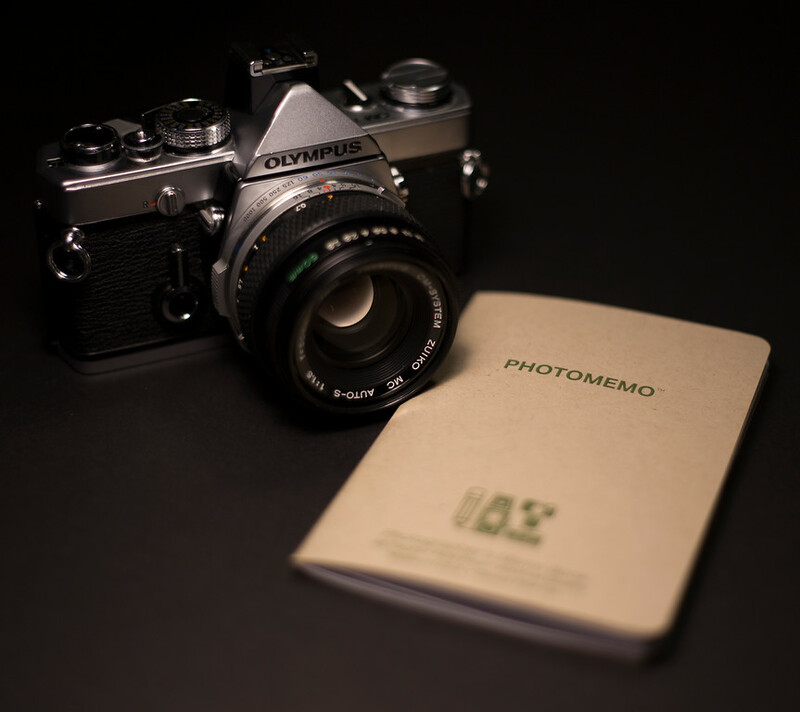 Overall, skip the fancy and expensive notebooks and get a two-pack of PhotoMemo notebooks. You won’t feel guilty about writing an email address on the cover or sketching something over the top of the pre-formatted pages in the PhotoMemo. For the price of a single Moleskin, you could buy eight PhotoMemo notebooks! Use the discount code UTAHFILM and save 20% on your PhotoMemo order at ShootFilmCo.com. While you’re there, get some cool vinyl stickers, camera bag patches, and pins. 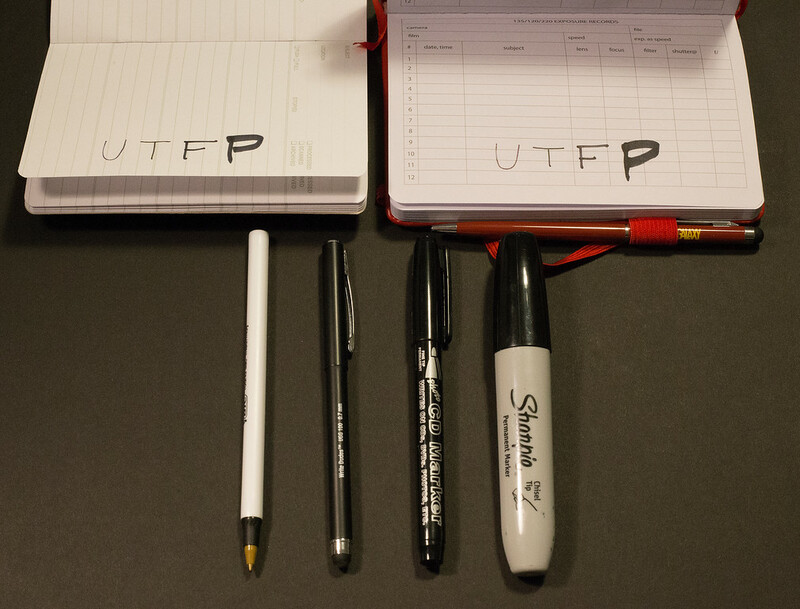 Mike Padua at ShootFilmCo.com has been gracious enough to give one lucky Utah Film Photography reader a set of PhotoMemo notebooks. 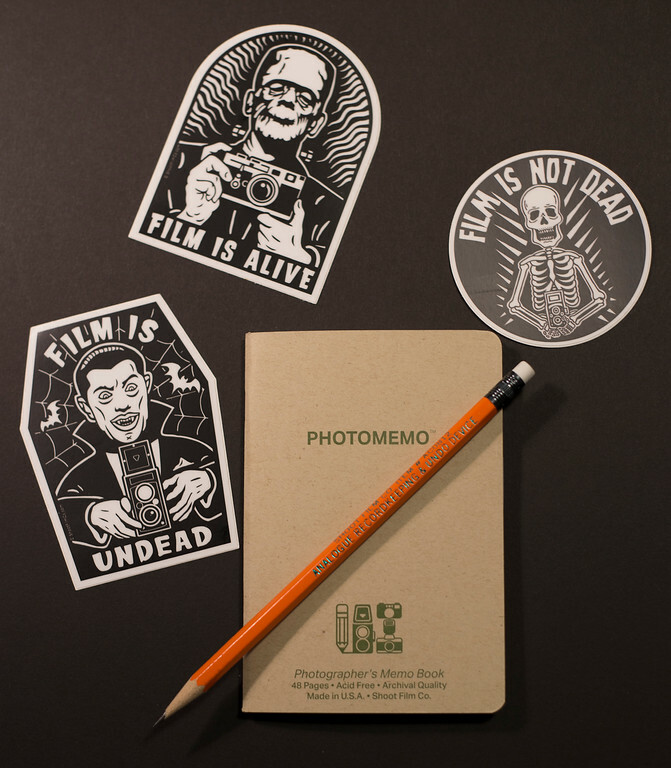 Simply leave a comment below and share what film and camera you would write in your PhotoMemo notebook. A random comment will be selected as the winner on October 31, 2016. This entry was posted on Wednesday, October 19th, 2016 at 12:02 PM	and tagged with Galaxy Photo Notebook, Memo, Mike Padua, Notebook, Photo Notebook, Photography Notes, PhotoMemo, ShootFilmCo.Com and posted in Product Review. You can follow any responses to this entry through the RSS 2.0 feed. Great review of these notebooks and you’re right on point with the review on the Galaxy Planner, I was disappointed as well with them. What camera, well I would use these to record all my notes, so that Hasselblad, Nikon F5, Crown Graphic! PS: Thanks for the shoutout! This looks fantastic, I’m reading consistently good reviews of the MemoBook ! I would probably write down stats about my 3 most used film cameras. Mamiya RB67 , canon AE1 , Nikon F90X. Love them all !! I just picked up my first medium format, the Mamiya M645. I think would be a lot easier than having to take out my phone every 10 minutes to type stuff in my notes. So, Mamiya M645, Nikon N90S, Canon AE-1 with Fuji400. Been putting a lot of lomo earl grey 400 through my Mjuii and Pentax P3 lately. Probably my box camera Kodak Target 6-20 with some rerolled Ilford FP5 120 onto 620 spools. My Nikon F3 with my favorite film stock, Portra 160. I found you by Chance and I’m hooked. I will order with you soon 🙂 keep up the great work. As far as the photo memo is concerned I would use it for my Eos 5 / A2 with portra 160 and ektar 100. This thing looks to be a life saver! I would log Impossible project sx-70 instant film for my sx-70 sonar camera. This would be a HUGE help seeing instant film is so touchy to different lighting and tempatures so I could write all of my settings down in this handy little book! Great review and great looking product! Thank you so much for this chance! I’ll be shooting the Yashica May and Tri-X. I’d definitely use it to keep track of my pictures on some Mr. Brown low iso (6asa) film and my Nikon F2. My Mamiya 645 and Ektar 100!! Olympus trip and portra 160! I recently picked up a Olympus OM-1 w/F.Zuiko 50mm 1:1.8 beauty of a lens on it from a thrift shop. If my test roll is a success no doubt that I would be documenting it. Happy shooting ! I would probably start with a Canon AE-1 (since it’s my most recently acquired) and go with Kodak 5247 cuz I don’t even know what to do with the 2 rolls I have of it. Using Random.org for a random number between 1 and 30, the lucky number is comment #23. That’s you! Sweet review! I’m quite the newbie to film, but I’d write either a Canon A1 or Olympus Trip 35 in my Photomemo and some crappy Kodak ColorPlus 200 because I’m pretty broke. I’d be using it to document my work with my Olympus OM20. I got given this camera by a family friend, and I often prefer it to my digital camera. I’d probably use Milford hp5 400 asa film. 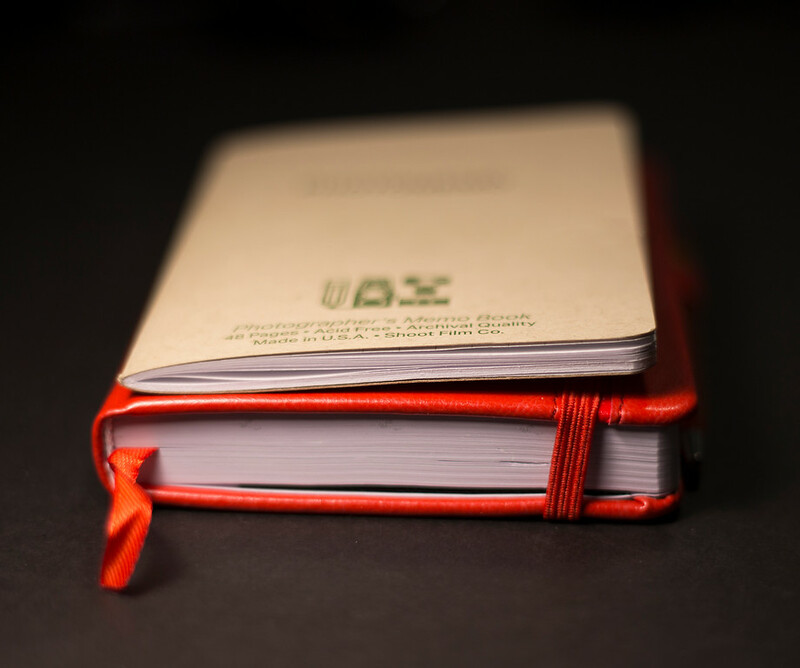 What’s cool about the photo memo book is it’s size: it looks pliable, like you can scrunch it up a little in your pack and it’ll only make it cooler looking with some doodles, coffee stains, blood and a little dirt mashed in. I’m digging those stickers too. For me there’s only one answer: it’ll be my Nikon F6 running PanF. Right now I’m shooting HP5 in my Pentax K1000, that’s what I’d start with, also running a roll of Fuji Superia through my Nikon FM2, that would be next! Yashica Electro 35 and HP5! !